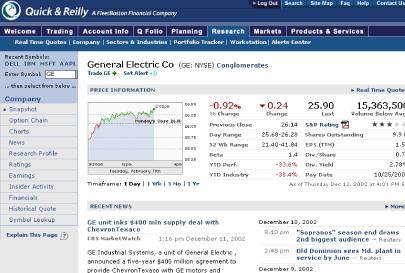 In the Fall of 2003, we approached Quick & Reilly with a proposal to redesign their email alert offering. My idea was to integrate the alert subscription process with the company research area. Users would be given the ability to quickly add an alert -- such as "send me an email alert when this company's price goes over $40" -- without disrupting their research process. We launched the redesign in December of 2003. Without marketing support, in 6 months subscribers more than doubled and alerts sent increased four-fold. In the 5 years since launch, this design pattern has been adopted by all major online brokerage firms.